Description: EGFR and its ligands are cell signaling molecules involved in diverse cellular functions, including cell proliferation, differentiation, motility, and survival, and in tissue development (Wang et al., 2004). Function: Carlin et al. (1982) showed that both the 145- and 165-kD EGFR proteins from A431 cells bound radiolabeled EGF, and both were phosphorylated upon EGF stimulation. Haley et al. (1987) showed that the activity of the EGFR promoter was modulated by adenovirus protein E1A. Stimulation with phorbol ester or fetal calf serum increased EGFR mRNA levels. Source Reference: [PubMed ID: 8055914] Gregoriou M, Willis AC, Pearson MA, Crawford C, The calpain cleavage sites in the epidermal growth factor receptor kinase domain. Eur J Biochem. 1994 Jul 15;223(2):455-64. [PubMed ID: 25029118] ... Kadota K, Yeh YC, D'Angelo SP, Moreira AL, Kuk D, Sima CS, Riely GJ, Arcila ME, Kris MG, Rusch VW, Adusumilli PS, Travis WD, Associations between mutations and histologic patterns of mucin in lung adenocarcinoma: invasive mucinous pattern and extracellular mucin are associated with KRAS mutation. Am J Surg Pathol. 2014 Aug;38(8):1118-27. doi: 10.1097/PAS.0000000000000246. [PubMed ID: 25226713] ... Shikhrakab H, Elamin YY, O'Brien C, Gately K, Finn S, O'Byrne K, Osman N, Epidermal growth factor receptor (EGFR) mutation testing, from bench to practice: a single institute experience. Ir Med J. 2014 Jul-Aug;107(7):201-4. [PubMed ID: 25033601] ... Ryzhova MV, Shishkina LV, Zheludkova OG, Golanov AV, Gorelyshev SK, Pitskhelauri DI, Bekiashev AKh, Kobiakov GL, Absaliamova OV, Sycheva RV, Korshunov AG, [Comparative characteristics of genetic aberrations in glioblastomas in children and adults]. Zh Vopr Neirokhir Im N N Burdenko. 2014;78(2):3-11; discussion 11. [PubMed ID: 17426253] ... Maegawa M, Takeuchi K, Funakoshi E, Kawasaki K, Nishio K, Shimizu N, Ito F, Growth stimulation of non-small cell lung cancer cell lines by antibody against epidermal growth factor receptor promoting formation of ErbB2/ErbB3 heterodimers. Mol Cancer Res. 2007 Apr;5(4):393-401. [PubMed ID: 16799092] ... Wu SL, Kim J, Bandle RW, Liotta L, Petricoin E, Karger BL, Dynamic profiling of the post-translational modifications and interaction partners of epidermal growth factor receptor signaling after stimulation by epidermal growth factor using Extended Range Proteomic Analysis (ERPA). Mol Cell Proteomics. 2006 Sep;5(9):1610-27. Epub 2006 Jun 23. [PubMed ID: 16843263] ... Wang SE, Narasanna A, Perez-Torres M, Xiang B, Wu FY, Yang S, Carpenter G, Gazdar AF, Muthuswamy SK, Arteaga CL, HER2 kinase domain mutation results in constitutive phosphorylation and activation of HER2 and EGFR and resistance to EGFR tyrosine kinase inhibitors. Cancer Cell. 2006 Jul;10(1):25-38. [PubMed ID: 16083266] ... Wu SL, Kim J, Hancock WS, Karger B, Extended Range Proteomic Analysis (ERPA): a new and sensitive LC-MS platform for high sequence coverage of complex proteins with extensive post-translational modifications-comprehensive analysis of beta-casein and epidermal growth factor receptor (EGFR). J Proteome Res. 2005 Jul-Aug;4(4):1155-70. [PubMed ID: 16729043] ... Schulze WX, Deng L, Mann M, Phosphotyrosine interactome of the ErbB-receptor kinase family. Mol Syst Biol. 2005;1:2005.0008. Epub 2005 May 25. [PubMed ID: 14560030] ... Agazie YM, Hayman MJ, Molecular mechanism for a role of SHP2 in epidermal growth factor receptor signaling. Mol Cell Biol. 2003 Nov;23(21):7875-86. [PubMed ID: 11983694] ... Wu W, Graves LM, Gill GN, Parsons SJ, Samet JM, Src-dependent phosphorylation of the epidermal growth factor receptor on tyrosine 845 is required for zinc-induced Ras activation. J Biol Chem. 2002 Jul 5;277(27):24252-7. Epub 2002 Apr 30. [PubMed ID: 11223155] ... Held-Feindt J, Forstreuter F, Pufe T, Mentlein R, Influence of the somatostatin receptor sst2 on growth factor signal cascades in human glioma cells. Brain Res Mol Brain Res. 2001 Feb 19;87(1):12-21. 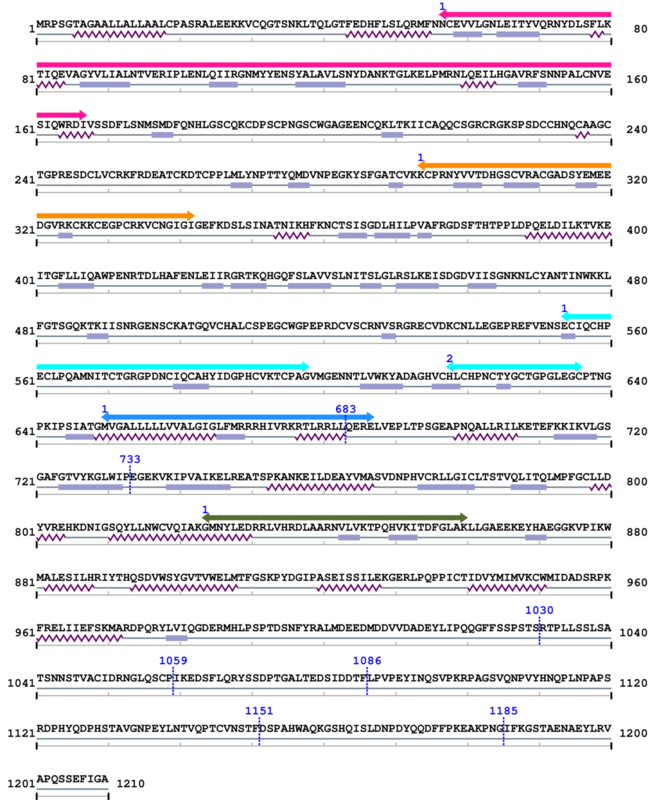 [PubMed ID: 10635327] ... Levkowitz G, Waterman H, Ettenberg SA, Katz M, Tsygankov AY, Alroy I, Lavi S, Iwai K, Reiss Y, Ciechanover A, Lipkowitz S, Yarden Y, Ubiquitin ligase activity and tyrosine phosphorylation underlie suppression of growth factor signaling by c-Cbl/Sli-1. Mol Cell. 1999 Dec;4(6):1029-40. [PubMed ID: 10347170] ... Feinmesser RL, Wicks SJ, Taverner CJ, Chantry A, Ca2+/calmodulin-dependent kinase II phosphorylates the epidermal growth factor receptor on multiple sites in the cytoplasmic tail and serine 744 within the kinase domain to regulate signal generation. J Biol Chem. 1999 Jun 4;274(23):16168-73. [PubMed ID: 10075741] ... Biscardi JS, Maa MC, Tice DA, Cox ME, Leu TH, Parsons SJ, c-Src-mediated phosphorylation of the epidermal growth factor receptor on Tyr845 and Tyr1101 is associated with modulation of receptor function. J Biol Chem. 1999 Mar 19;274(12):8335-43. [PubMed ID: 9733788] ... Keilhack H, Tenev T, Nyakatura E, Godovac-Zimmermann J, Nielsen L, Seedorf K, Bohmer FD, Phosphotyrosine 1173 mediates binding of the protein-tyrosine phosphatase SHP-1 to the epidermal growth factor receptor and attenuation of receptor signaling. J Biol Chem. 1998 Sep 18;273(38):24839-46. [PubMed ID: 9556602] ... Abe Y, Odaka M, Inagaki F, Lax I, Schlessinger J, Kohda D, Disulfide bond structure of human epidermal growth factor receptor. J Biol Chem. 1998 May 1;273(18):11150-7. [PubMed ID: 9363897] ... Yamauchi T, Ueki K, Tobe K, Tamemoto H, Sekine N, Wada M, Honjo M, Takahashi M, Takahashi T, Hirai H, Tushima T, Akanuma Y, Fujita T, Komuro I, Yazaki Y, Kadowaki T, Tyrosine phosphorylation of the EGF receptor by the kinase Jak2 is induced by growth hormone. Nature. 1997 Nov 6;390(6655):91-6. [PubMed ID: 8845374] ... Lombardo CR, Consler TG, Kassel DB, In vitro phosphorylation of the epidermal growth factor receptor autophosphorylation domain by c-src: identification of phosphorylation sites and c-src SH2 domain binding sites. Biochemistry. 1995 Dec 19;34(50):16456-66. [PubMed ID: 1333047] ... Li W, Hu P, Skolnik EY, Ullrich A, Schlessinger J, The SH2 and SH3 domain-containing Nck protein is oncogenic and a common target for phosphorylation by different surface receptors. Mol Cell Biol. 1992 Dec;12(12):5824-33. [PubMed ID: 1382070] ... Krieg J, Hunter T, Identification of the two major epidermal growth factor-induced tyrosine phosphorylation sites in the microvillar core protein ezrin. J Biol Chem. 1992 Sep 25;267(27):19258-65. [PubMed ID: 1322798] ... Lowenstein EJ, Daly RJ, Batzer AG, Li W, Margolis B, Lammers R, Ullrich A, Skolnik EY, Bar-Sagi D, Schlessinger J, The SH2 and SH3 domain-containing protein GRB2 links receptor tyrosine kinases to ras signaling. Cell. 1992 Aug 7;70(3):431-42. [PubMed ID: 1301150] ... Chi DD, Hing AV, Helms C, Steinbrueck T, Mishra SK, Donis-Keller H, Two chromosome 7 dinucleotide repeat polymorphisms at gene loci epidermal growth factor receptor (EGFR) and pro alpha 2 (I) collagen (COL1A2). Hum Mol Genet. 1992 May;1(2):135. [PubMed ID: 1309762] ... Countaway JL, Nairn AC, Davis RJ, Mechanism of desensitization of the epidermal growth factor receptor protein-tyrosine kinase. J Biol Chem. 1992 Jan 15;267(2):1129-40. [PubMed ID: 2543683] ... Countaway JL, Northwood IC, Davis RJ, Mechanism of phosphorylation of the epidermal growth factor receptor at threonine 669. J Biol Chem. 1989 Jun 25;264(18):10828-35. [PubMed ID: 2987962] ... Davis RJ, Czech MP, Platelet-derived growth factor mimics phorbol diester action on epidermal growth factor receptor phosphorylation at threonine-654. Proc Natl Acad Sci U S A. 1985 Jun;82(12):4080-4. [PubMed ID: 2984676] ... Davis RJ, Czech MP, Tumor-promoting phorbol diesters cause the phosphorylation of epidermal growth factor receptors in normal human fibroblasts at threonine-654. Proc Natl Acad Sci U S A. 1985 Apr;82(7):1974-8.